I just love, love a poached egg. I only discovered the heaven of a runny yolk as an adult — I grew up eating hard-boiled and fried eggs with the yolks broken. Wow, was I missing out. I am a big fan of eggs at lunch and dinner, not just breakfast. They are super versatile and easy — and have you tried one on a burger? Yum. I found this recipe upon returning from a two-week trip in Europe, with the joy and guilt of frequent four-course lunches and excessive butter/cream/cheese/wine consumption hanging over my head. Which is not to say there is not cheese and whole milk in this dish, because there is. But its simplicity appealed, as did the absence of meat and the inclusion of some dark greens (vegetables!). I found it in an old Food & Wine magazine, it’s a Bobby Flay recipe. And did I mention it’s delicious? The polenta is nice and cheesy, the greens spiked with garlic and onion and red wine vinegar, and all topped with an awesome, spicy chile oil and of course a poached egg. So many great flavors happening. Just break the yolk up and stir up all the goodness together. I’m pretty certain the polenta I had in the cupboard was instant, and this recipe calls for the regular (non-instant) type. By all means though, use instant — it’s quicker and easier. Just don’t start it until everything is nearly done as it cooks really quickly. Poaching an egg is an art. I found that 3-3 1/2 minutes was more like it for the cook time, to ensure a runny yolk (but I was poaching them one by one versus four in the same pot). Play around with it. Poach enough eggs for the number of servings you’re preparing, and for leftovers, reheat the polenta and greens in the micro and poach the egg so it’s fresh. The polenta needed a bit more salt. Cook the polenta: Bring 3 cups cold water, the milk, 1 teaspoon salt and 1/2 teaspoon pepper to a boil in a medium saucepan over high heat. Gradually whisk in the polenta; whisk constantly until the mixture is smooth and begins to thicken, about 5 minutes. Reduce the heat to medium low and simmer, stirring often, until tender and thickened but still creamy, about 30 minutes. Add more hot water as needed if the mixture seems too dry. Stir in the butter and cheese. Meanwhile, make the braised greens: Heat the olive oil in a large high-sided saute pan over medium heat. Add the onion and cook until softened, 4 minutes. Add the garlic and cook, stirring occasionally, until slightly golden brown, about 2 minutes. 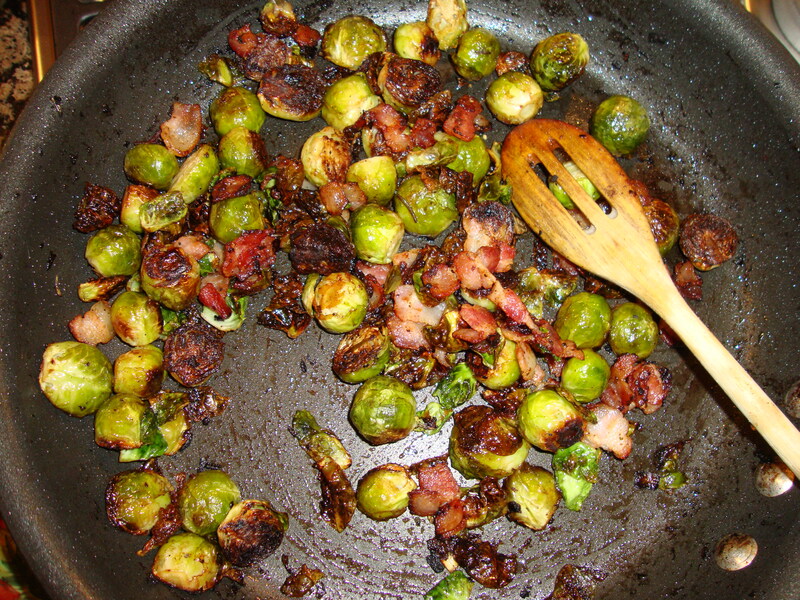 Add the greens, season with salt and pepper and toss. Reduce the heat to medium, stir in 1 cup water, cover and cook until wilted and soft, about 20 minutes. Remove the lid during the last 5 minutes to cook off any additional liquid. Stir in the red wine vinegar just before serving. Poach the eggs: Heat 3 cups water with the white vinegar until simmering in a large high-sided frying pan. Break each egg into a cup, then gently add to the water. Poach until the yolks are nearly set, 4 to 5 minutes. Remove the eggs from the pan with a slotted spoon to drain the liquid and place on a plate. Season with salt and pepper. To serve, spoon some of the polenta into bowls, top with some of the greens and a poached egg per bowl. Drizzle with the chile oil and garnish with the chopped parsley. It’s getting a little chilly here in San Diego (well, chilly for San Diego at least), just the weather that makes me crave some warm, comforting soups and chilis. 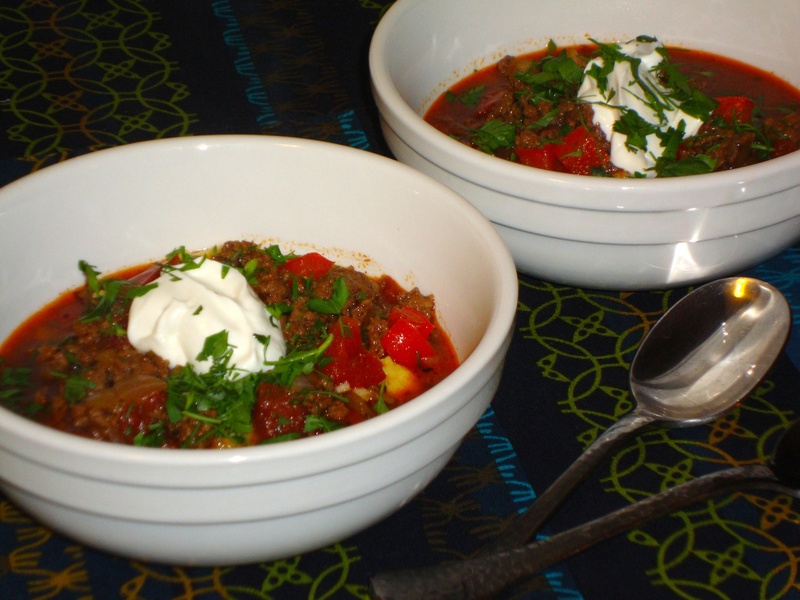 This Hungarian chili, a Rachael Ray recipe, is such a cool take on the traditional Mexican/Texan/Southwestern varieties. It uses basic chili ingredients (onion, pepper, chile, tomato) but switches up the spice with paprika and marjoram/oregano. But the real kicker is the smoked gouda polenta that the chili makes its home atop. That’s right, I said smoked gouda. This creamy, cheesy polenta truly makes the dish. You get some smoky flavors from the chile and the chili powder and paprika, but also from the cheese, and the bright herbs on top add just the right note of freshness. 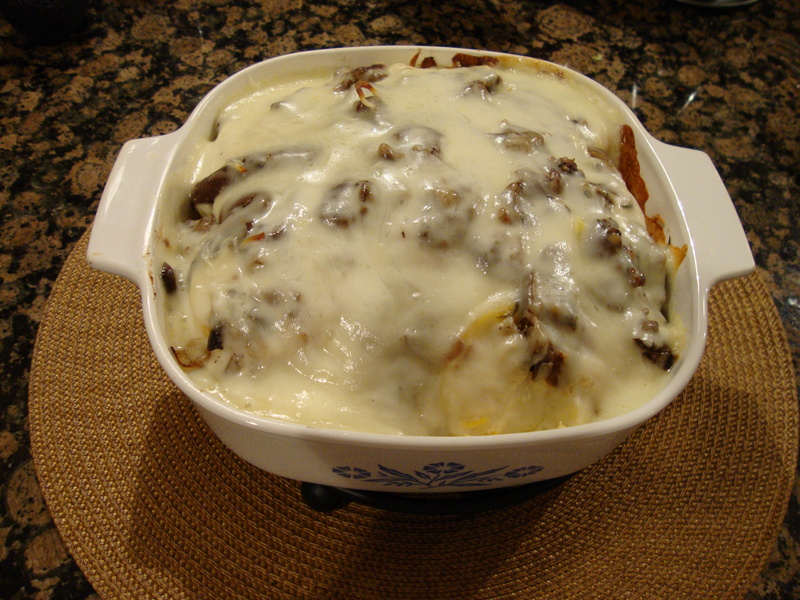 You’ll want to curl up on the couch or in front of a fireplace with this dish. Using a red pepper instead of green really makes a big difference in the flavors here — don’t switch it out! Find quick cooking polenta in the pasta aisle. Not the pre-made “roll” of polenta — it’s a grain-like consistency that reminds me of finer couscous. It comes in a box. Dill worked really well on top. This makes great leftovers — and would freeze well if you make a double batch. Just make the polenta fresh. Heat a large pot over medium-high to high heat. Add beef and brown 7-8 minutes. Add hot pepper, bell peppers, onions and garlic and season with salt and pepper. Cook to soften vegetables, 7-8 minutes more. Stir in chili powder, sweet paprika and oregano. Add tomato paste to pot and stir to combine, 1 minute. Add stock to pot and bring chili to a boil. Reduce heat to simmer and cook 15 minutes more. In a separate pot, bring water or chicken stock and milk to a boil, whisk in polenta and cook 2-3 minutes until thickened. Stir in butter and cheese, season with salt and pepper. 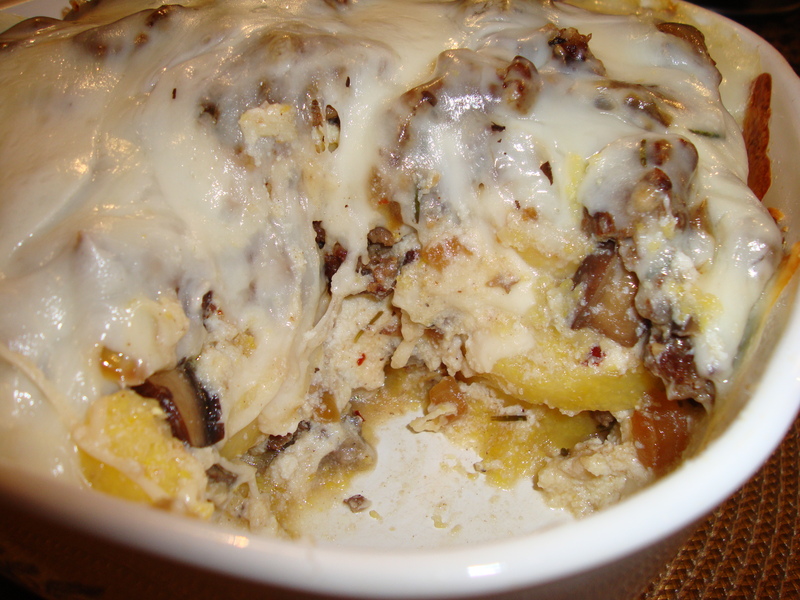 Fill shallow bowls with polenta, make a well in the center. 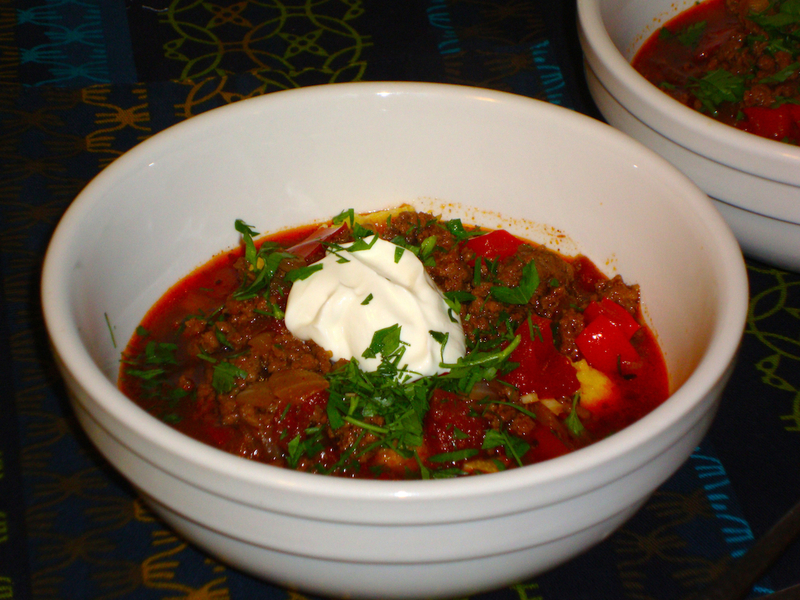 Fill well with ladles of chili and top with sour cream and herbs.